CORTES LANDSCAPING HAS CONSIDERABLE EXPERIENCE IN EITHER INSTALLING NEW DRIVEWAYS AND PARKING AREAS OR UPGRADING EXISTING ONES. CORTES CAN CLEAR AREAS AND INSTALL DRIVES FROM MANY DIFFERENT MATERIALS, DEPENDING ON THE AESTHETIC AND COST CONSIDERATIONS THAT ARE IMPORTANT TO THE CLIENT. IN ADDITION, CORTES CAN DESIGN AND INSTALL APPROPRIATE DRAINAGE CULVERTS AND FIELDS, TO ENSURE THAT ROADWAYS WILL BE FREE OF MANAGEABLE LEVELS OF WATER RUNOFF. 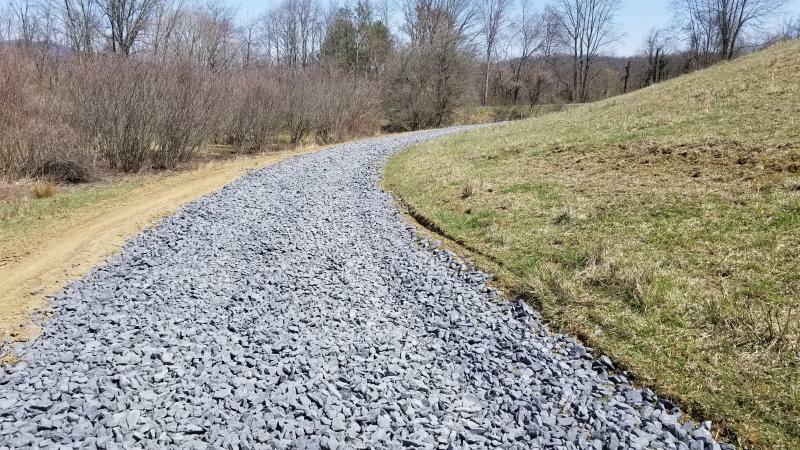 CORTES IS ALSO VERY SENSITIVE TO ENVIRONMENTAL ISSUES AND WILL WORK WITH EACH CLIENT TO ENSURE THAT ROADWAYS AND DRIVEWAYS ARE INSTALLED IN MANNERS THAT RESPECT THE LAND. AS NOTICED IN THE PHOTOGRAPH IMMEDIATELY ABOVE, WE CAN PRESERVE TREES AND DESIGN ACCESS ROUTES TO TAKE ADVANTAGE OF NATURAL SURROUNDINGS. CALL AND LET'S DISCUSS HOW WE CAN DESIGN OR IMPROVE ON YOUR DRIVEWAY OR ROADWAY NEEDS.